Designed to help shift tough food soils, our Stainless Steel Scourers are perfect for both domestic and commercial environments. Each one has been manufactured from a stainless steel wire which effectively cuts through burnt and dried on food. They are supplied in a pack of 5 which can be stored along with the rest of your janitorial equipment until required. 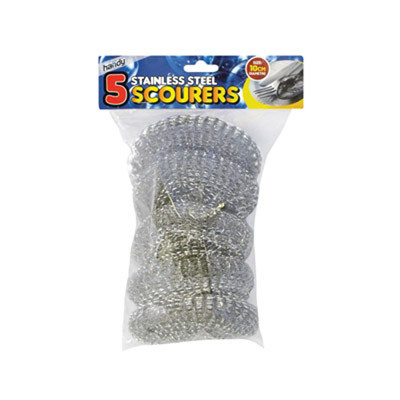 A handy tool for your catering environment, these scourers are highly effective and work with or without dishwashing liquid. Here at Gompels, we have a wide range of cleaning resources to ensure your dishes are sparkling after every meal. Including our Hand Grip Sponge Scourers and our Dish Cloths, you'll find everything you need for your business right here.